The Zero Calibration Kit provides a fast and cost-effective method for calibration. The unit produces carbon dioxide free air from ambient air. 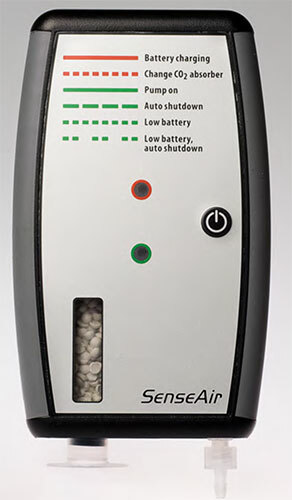 The hand held Zero Calibration Kit includes all the necessary components for calibration of any SenseAir® CO2 sensor. The kit consists of a carrying case including charger and replacement cartridges. The indicators on the unit advice when to charge and replace the CO2 absorbent cartridge. and soda lime result in CO2 reduced “clean” air.